Chemical Constituents and Components : Main chemical constitutes are tannins, triterpenoid saponins (arjunic acid, arjunolic acid, arjungenin and arjunic acid), flavonoids, gallic acid, ellagic acid and phytosterols. Tannins / Arjunolic Acid: 1. It increases HDL cholesterol and decreases the LDL cholesterol. 2. It is significantly active against the human oral, ovarian and liver cancer cell lines. 3. It is a free radical scavenger and inhibitor for the hypochlorous acid production. 4. It significantly inhibits the growth of bacteria. Curing Diseases : 1. It prevents heart attack, skin diseases and urinary infection. 2. It acts against cirrohsis of liver and also acts as a diuretic. 3. It strengthens the heart muscles and maintains the heart functioning properly. 4. 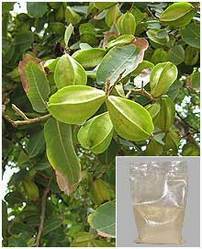 It is used as expectorant, aphrodisiac, tonic and diuretic. 5. It acts against oedema and also fights against skin aliments like acne.